After having an email account for several years, you probably are used to checking your email each morning and finding dozens of emails from a variety of sources. Many of these e-mails are a result of you signing up for accounts with other companies and websites, while some have obtained your email address by purchasing it so they can send you unrelenting amounts of spam. 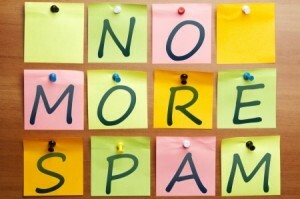 Whether you have just created a new e-mail address or are trying to save your existing one from spam, these tips will go a long way in keeping your inbox free from junk. If you are receiving an endless supply of junk in your inbox, try looking at the bottom of each email for unsubscribe options. In most countries, the law requires that companies offer a way for you to unsubscribe from their email lists and to be freed from the daily and/or weekly barrage of emails. Generally, there is a link at the bottom on which you can click. You will be redirected to their website or that of the company that manages their email service. From here, simply input your email address and you will be removed from these problems. I managed to decrease my email load by 50% just through this one trick. Whenever we are filling out registration forms and the like, we may neglect to notice that there are “voluntary” checkboxes that will be automatically selected in order to have permission to blast us with tons of emails. Always make sure to read over what each checkbox entails in order to avoid any new spam from making it into your inbox. Checkboxes such as these can make the difference between getting one email per month from a company versus one email per day. Anything such as “Can we contact you?”, “Would you like to receive offers every hour?” and the like are clear signs of this. Many people simply keep more than one email address for the purpose of keeping their primary email address’ inbox clean and clear of spam. Whenever you register for a new product, website or service, you can use the alternate email as a way to collect whatever information is necessary or to activate an account. This will keep you protected while still having full accessibility. Generally speaking, you can use an email account like this for all other things besides your personal correspondence, which would remain on your primary email. You would be surprised at how quickly someone can find your email address when posted online, in forum profiles or in other similar circumstances. Never give out your email in its actual form: rather, use a tool such as Pingler’s Email to Image Converter to make sure that your email address cannot be simply copy and pasted by a bot or user into a list that they will then sell to spammers later on. Doing this is perfect, especially for posting online advertisements on sites where bots are notorious at crawling the pages for email addresses. What Can We Learn from Celebrities about Customer Loyalty?